Home » Iron Gloves, gauntlets of the 15th century. 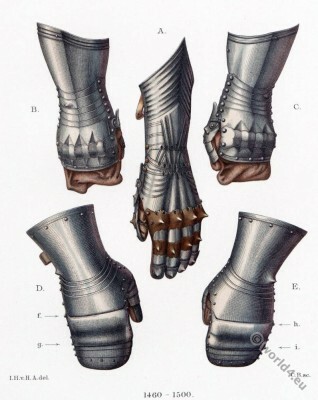 Iron Gloves of the 15th century. Iron gloves, gauntlets (1460-1500) from the palace of Count Törring Jettenbach-Jettenbach, Germany. A left glove of a superb armament after the ruling style of this period, which we were demonstrating in its essence several times by different examples. He has in his driven and ground out fluting as in the cutouts on the edges of each rail a certain type of ornamentation that is applied to all the associated harness parts. The rail with four high-powered spikes, which extends over the wrist at the base of the fingers, like the four individual rails with spikes, which extends over the wrist at the base of the fingers, like the four individual tracks with peaks at the middle phalanx of the four fingers and the heads of all the rivets are composed of brass while all the rest of bare steel. The pair of gloves: B of the right and C on the left, probably substantial deviations from the aforementioned type, however, was, albeit rare, at that time in use; the peculiar thereof is that the iron rails extend only to about the wrist, and the front part of the finger only by the leather lining, ie the underlying leather glove was protected. For closer understanding because of the shape we give both iron gloves in different position again. D and E show a special kind of gauntlets. We would ascribe them to a later epoch, if not a specific indication would be given for their formation period. In the famous Geneva altarpiece by Hubert and Jan van Eyck which was completed at the beginning of the 15th century, appear on the first of the two side wings, heraldic right, the three wise men from the east on horseback, surrounded by knights (decided portraits out of the era of the Master), among these is a young knight on horseback in the foreground to the right of the three kings. He wears, executed down to the smallest exactly the same gloves; you can see that they have their origin early on, but came more until the second half of the 15th century in use. Their peculiarity is that the mean width splint (here with f and g and the glove E, more incurved with h and i referred) has two bulges, in which the rails rest on movement of the hand inserted into each other. In the 16th century this type gauntlet was generally called mitten, where that middle part, was replaced by a two or three very protruding beads. This entry was posted in 1460, 15th Century, Germany, Middle Ages, Military and tagged Costumes art and utensils, Gothic costumes, Knighthood on 11/18/15 by world4.